Left to right – Cr Anthony Michael – Deputy Mayor, Inverell Shire Council, Adam Marshall MP – Member for Northern Tablelands, Alison Barber – Inverell Hospital’s Nursing Unit Manager (Emergency and Surgical Services), Hamish Yeates – Inverell Health Services Manager and the Hon Sarah Mitchell – Parliamentary Secretary for Regional and Rural Health. 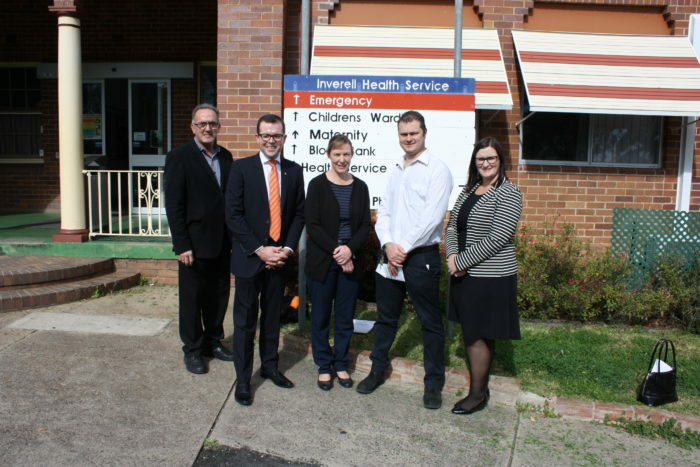 PLANNING for the eagerly-anticipated redevelopment of Inverell Hospital has begun, following a visit to the hospital this morning by Parliamentary Secretary for Regional and Rural Health Sarah Mitchell and Member for Northern Tablelands Adam Marshall. The Parliamentary Secretary was invited by Mr Marshall to inspect the hospital, meet with staff and inform the community of the timeline for the important upgrade. With the NSW Government committing $30 million to the large-scale redevelopment, Mrs Mitchell said planning would be completed over the next 18 months. “During 2015, Hunter New England Health (HNEH) will develop a Clinical Services Plan,” Mrs Mitchell said. “Once the detailed planning is complete, the redevelopment will be ‘shovel ready’, so construction can proceed. “With such a significant investment being made by the NSW Government, it is essential that the extensive redevelopment meets the health needs of the Inverell community for decades to come. Mr Marshall welcomed the Parliamentary Secretary to Inverell and said the community was excited to learn of the start of planning for a redevelopment long campaigned for. “The Inverell district’s population is growing and this is placing added demands on the hospital, which is showing the signs of age and a lack of major capital investment over a long period of time,” Mr Marshall said. “The community has campaigned hard for this redevelopment and I’m looking forward to the planning getting underway and ensuring the community is involved and kept informed. Mr Marshall said once the Clinical Services Plan was finalised, a project team would be assembled to deliver a Preliminary Business Case. “It’s essentially a first draft of what kind of services should be included in the redevelopment and what facilities need to be redeveloped or constructed to support them,” Mr Marshall said. The redevelopment will be overseen by NSW Health Infrastructure in partnership with the HNEH Capital Works Department. The project team will also include key Inverell Health Services staff and consultants including a project manager, cost manager and architect.